First Line: "Whom do you trust, Mattie?" Deputy Mattie Cobb is having a difficult time dealing with issues from her past, and as a result, she's withdrawn from veterinarian Cole Walker and his family. Instead, Mattie focuses on work and on training her K-9 partner, Robo. Shortly after Robo and Mattie find the body of a missing school girl, another young girl goes missing, and this time it hits hard. The missing girl is one of Cole's daughters, and there's nothing Mattie won't do to find her. Deputy Mattie Cobb is more emotionally attached to her K-9 partner, Robo, than she is to anyone or anything else, and it's this attachment that makes them one of the best teams in crime fiction. However, in this third book in Mizushima's riveting series, Mattie is much too emotionally involved to be objective, and readers get to see her coming off the rails in her frenzy to find Cole's daughter. One of the reasons why Mattie loses her objectivity is because she really doesn't understand mental illness-- one of the issues Mizushima handles so well in Hunting Hour-- and this stresses the importance of proper training for all police officers, not just the four-legged ones. 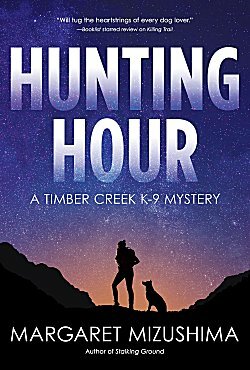 As in the previous two books, Hunting Hour is a superb look at working dogs in a police department, their training, what they're capable of doing, and how those capabilities could expand. The book also has the author's trademark action sequences that keep readers glued to the page, and the rich relationships between the main characters that make them so easy to care about. Evidently my whodunit radar was in fine fettle when I read this because I spotted the villain immediately. Perhaps it's the work I did in a mental health institution so many years ago. I really don't know. Be that as it may, I enjoyed Hunting Hour, and was happy to see a small hint at the end that leads me to believe that Mattie and Robo could have new challenges in the future. I really think a new direction is needed because the series has been heavy on child jeopardy. After all, Cole's daughters have had more than their share of terror! If you're a fan of small town Colorado settings, action that gets your adrenaline pumping, solid mysteries, wonderful dogs, and a fine cast of characters, you're in for a treat with Margaret Mizushima's Timber Creek K-9 series. Start at the beginning with Killing Trail! I respect any author who can weave in interesting information (in this case, about police dogs) with a good plot, Cathy. I'm glad you're liking this series so well. I hope she continues to write because she gets better with every book. I'll try one of these books -- if the dogs don't talk, have ESP or crochet, if they're just regular, smart dogs. And I haven't read any Colorado-based crime fiction since Stephen White's Alan Gregory series ended so abruptly. When I was little, I loved to watch "Lassie" on TV, but even then I knew Lassie wasn't a "real dog." When the grownups would crack jokes about her running in the kitchen to spell help in the mashed potatoes, I'd laugh, too. But in Mizushima's books, Robo (and any other dog that makes an appearance) is just a highly intelligent, well-trained dog. Lassie, oh, I can't even think about Lassie. When she was lost and Timmy was crying, "Lassie," my sister and I couldn't take it. Even now we say we can't watch it. It's acting, I know, and even Lassie is acting, but still. My mother wouldn't let me watch "Lassie" for a while because I almost became hysterical during the episode when Lassie's puppy/puppies fell down a well. I think that's when I learned that television/movies weren't real life. You learned that at a young age. I would still be upset if I saw fictional puppies falling down a well. There are still cruelties towards animals on film, so I don't know when it's real and when not.